When I first heard that shampoo bars were a safer alternative to regular shampoos, I didn't hop on the bandwagon. I was perfectly content with my baking soda routine, which I knew was also a safe alternative. But I changed my mind when I saw before and after pictures of women who used shampoo bars. The difference was amazing! I thought to myself, "My hair doesn't look like that after I wash with baking soda." So I decided to look at the ingredients of a few brands that were listed. Just essential oils, carrier oils, herbs and butters. That's when I realized my hair and I were missing out. As a vegan, I don't only advocate cruelty-free products. I advocate 100% vegan products. Which is why I turned to Herbolution (http://www.etsy.com/shop/Herbolution) to sample and review their new rosemary mint shampoo bar. Herbolution is an eco-friendly company that sells 100% natural products. Their vast supply of vegan beauty products literally puts a smile on my face. I'm proud to see a shop that considers the vegan minority the way Herbolution has over the years. Shampoo bars are often: Sulfate free, Silicone free, Paraben free and Free of other harmful preservatives. They tend to have natural, organic ingredients that to replace the nutrients and moisture lost during your normal wash routine. An added bonus is they heal and seal the hair cuticle making hair appear much smoother! If you have frizzy hair, this can really help reduce or even eliminate your frizzy hair which is what most of us want. You can also eliminate that second step in your routine: the conditioner. Keep in mind that no two shampoo bars are alike. Think natural and vegan when making your purchase. Before I tell you about my experience, first let's talk about the product. You should know that this shampoo bar is completely: Vegan, Natural and Eco-Friendly. Although it's not 100 percent organic, it's infused with organic essential oils as well as coconut and castor oil to cleanse your hair. The makers at Herblution, Sasha and Veronika (husband and wife), began with a simple green juice made of herbs picked from their own garden. You'll smell the potency of the herbs long before you open the package. The nutrients from the peppermint, spearmint, rosemary and sage add healing properties, so the shampoo bar may treat chemically damaged hair. It was a little different than what I was used to, but I got the hang of it. I gently wet the shampoo bar, then rubbed it between my palms until it created a lather. The lather comes very easily with Herbolution's Rosemary Mint shampoo bar, thanks to the virgin coconut and castor oils which also deeply hydrate and moisturize your locks. You don't need much, a little goes a long way. After that, I simple massaged the lather into my scalp with the pads of my fingers to remove grime and oil. I read that doing this for one minute is among the most crucial steps in hair washing. Travel down the length of your hair, crunching the lather into your strands. Let it sit for five to ten minutes. The smell was an absolute delight! It's an aromatic fragrance that I can't put into words. I left that to the makers at Herbolution: "A refreshing unisex scent that comes from pure natural and organic essential oils." Sasha and Veronika say to follow up with an ACV (apple cider vinegar) rinse, but this isn't necessary. It's recommended for first time users to "transition" your hair into a new experience. ACV also adds great moisture and shine. I left out the ACV rinse because this adds moisture because I wanted to see how well Herbolution's shampoo bar would moisturize on its own. So I let my hair air dry and was really surprised at the resulting moisture and softness! Unlike most commercial brands, this shampoo bar will moisturize your hair. Does this mean bye-bye conditioners? For some hair types, yes. But for curly textures like mine, a light leave-in conditioner is a good idea. Just apply to the ends of hair and your ready to style and go. You can get a 4 oz. 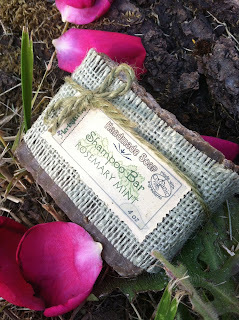 Rosemary Mint Shampoo bar for $7.00 + shipping online at the Herbolution Etsy store. That's a bargain when it will last at least three months or more compared to how often you buy shampoo and conditioner and what you spend on average for two bottles. Herbolution currently has a discount on all of their products for Ria Lives Well readers. Simply enter the coupon code (http://rialiveswell.wordpress.com/2013/07/13/behind-the-scenes-w-herbolution/) before the offer ends!